We studied the first sentence yesterday. This long (it's the entire first paragraph) and tangled sentence is hard to follow, but it creates a necessary context for today's passage. Peter compares unbelievers — the "spirits in prison" — to the unrighteous before the flood, and Noah and his family to those saved by Christ. Noah was brought to safety "through water". The water for Noah was, of course, the physical manifestation of God's vengeance against the wicked. In the second paragraph, Peter turns this on its head, as water becomes the physical sign of God's grace in baptism. It isn't a complete turnaround in how water is used as a symbol, however; in both cases, it is water which divides those who are saved from those who are condemned. Remember, from the first two books of 1 Peter, how much emphasis Peter puts on God choosing and calling those who will be saved. Water, in both the Noah story and the life of Christ, is used to separate the righteous. So although we usually think of water as a means of destruction and death in the Noah story, to Peter, the water is a blessing for Noah, in the sense that it identifies him as one who has been called and saved. Peter then reminds us of a third property of water. We wash with it. Water cleans the physical dirt from our body, just as the water of baptism symbolizes cleaning the sin from our soul. But Peter wants us to look at baptism a different way. Here he implies that the water of baptism is the water of the flood. 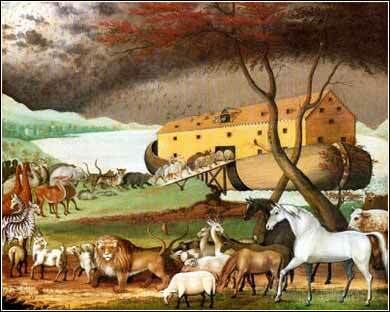 It symbolizes our faith that Christ, like the ark that God told Noah to build, will save us from God's wrath. Water, the enemy of the wicked and the instrument of their destruction, becomes the friend of the righteous. Noah's Ark by Edward Hicks, c. 1846.